The consort-scaled musical possibilities of this room raised the prospect of a rare harmony between architctural, tonal, and technical aspects of organ building. Features of the space include a brick floor and plaster walls and ceiling. For the visual design of the organ a classical (slightly understated) concept was pursued. 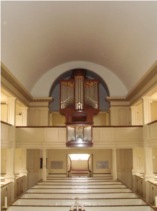 The need for a place to put the pipework of the second manual division led to the inclusion of an independently encased portion of the organ located in time-honored fashion at the front of the balcony, to which is assigned the old English name "chaire". Inspiration for the front of the chaire, as well as that of the main case, was derived from the work of John Snetzler (or Johann Schnetzler), a Swiss-born London organ builder of the mid 18th century. The radius work, rising double curves and simple embellishments featured in some of Snetzler's English work seemed entirely at home in this space, with its tower arch and vaulted ceiling. While not immediately obvious, the geometry of the case fronts includes small elements of asymmetry: and interplay between symmetry and asymmetry is carried over into numerous aspects of the interior design. The largest visible pipe is six-foot F.
The casework is made of French walnut. The trees grew in the vicinity of the prehistoric cave sites in Les Ezyies-de-Tayac-Sireuil wiki such as Lascaux. In keeping with European tradition, the rough sawn boards from each log were kept together as a set. Special to the European species of walnut is the waisted trunk form and variegated coloration, particularly dark streaks. The case maker, Glenn Marriner, who also did all the finishing of the wood, searched among the boards for figure applicable to the visual requirements of each piece. Both the main case and the chaire case employ extensive mortise and tenon joinery. All the "radius work" in the case is steam-bent. The carved pipe shades and two Celtic panels - which are on the sides of the chaire case - are of Pacific yellow cedar, which is left natural. The carving itself was done by Frederick Wilbur goto of Lovingston. The front pipes are of seventy-five percent tin, with sheen and color produced by chalk. The organ has sixteen stops, comprising 1,088 pipes, disposed over two manuals and pedal. The starting point in the tonal design was the nature of the room itself, and above everything favorable placement of the organ in the room. The word which continually served to inspire various aspect of the design here was "classical", used here not to mean understatement but rather balance. The chief aim was to bring out sounds for the individual stops which are colorful and unique but also work well together and (between the manuals) "opposite" one another, particularly in small groupings or combinations: sounds with potential to delight and to stir the listener, which can be heard for quite long periods of time without becoming tiring. This is true of historical organs in several regions, but particularly in parts of Switzerland and adjacent countries. The full organ attains a richness through diversity of color and texture of sound, rather than massive weight of sound which might be demanded in a different space. Among the pipework are several different forms and materials: cylindrical and tapered pipes; stopped pipes (having their upper ends closed); half-stopped pipes, in which the closed upper ends are pierced and fitted with additional resonators referred to as "Chimneys"; flue pipes - the majority, with no moving parts; and reed pipes - in which a metal flapper or "tongue" vibrates. Worthy of special mention are the internally mitered "Haskell" pipes, made of wood, which speak the lowest six notes of the eight-foot pedal stop Bass Flute; as well as the open wood pipes, four of which are mitered in conventional fashion, which speak the first five notes of the eight-foot principal. These labor-intensive solutions remain as evidence of a strong desire to avoid compromising the musical versatility of the organ on account of space limitations. The acoustical nature of the room demanded a considerable degree of finesse in the voicing, but patience was rewarded. The pipework of the chaire, on account of its prominent location - and close proximity to listeners seated beneath it - demanded naturally to be the most refined in sound. But that of the main case is equally present in many of the room's seats, particularly the central pews, and is barely less so. Noted British organ-building scholar and historian Peter Williams once observed that despite all the freedom an organ builder has to start with a clean slate on every project, in the end the ear frequently leads to results lying within surprisingly narrow practical limits. This we experienced here most definitely. The resulting instrument has considerable potential. It can support congregational singing. It can be played with other instruments, both singly and in consorts of numerous configurations. Its relative small size notwithstanding, it can do justice to a large proportion or music written specifically for the organ: a repertoire which, accumulated in many different periods and regional styles, forms one of the most enormous for any single instrument. Some further particulars of the organ's construction are listed in the following. The key action for the chaire includes twice-diverted stickers which extend from beneath the keys to the floor, along with horizontal trackers. The pallet box of the chaire is inverted. Squares and diverters are of European hornbeam. Rollers are of hollow steel with components of hornbeam lignum vitae, and hickory. Roller boards are of edge-glued quartered Appalachian white oak, pinned Axle pivots are garnished with brass-backed teflon. Tracker connections employ leather nuts, and roll-threaded wires of phosphor-bronze, and connectors of hornbeam. Pallets are of white oak, with two different layers of leather. Trackers are of fine-grained quarter-sawn Sitka spruce. Stickers are of Pacific yellow cedar. The stop action is mechanical, with sliders of yellow cedar, chest table surfaces grooved throughout, and slider seals by Gerhard Schmid. Link rods are of white oak, and draw rods of French walnut. The windchest grids are of quartered white oak, old-growth ponderosa pine, and Eastern white pine. The tables are of yellow cedar. Toeboards are sandwiched in the classical manner, of white oak and white pine. Metal pipes are of the finest tin/lead alloys. Open metal flue pipes are cone-tuned or scroll-tuned. Stopped metal pipes have fixed (soldered) caps. Wood pipes are of yellow cedar, white oak, black walnut, and white pine, selected for the pertinent characteristics. Trim is of black walnut and cherry. The wind system includes wind trunks of solid quarter-sawn white oak, mitered, and a single wedge-shaped bellows. The wind is raised by a silent electric blower. The blower and bellows are located in a separately air-conditioned tower space behind the organ. The tremulant affects the entire organ and is based upon a North German style Subtle variations in setting are possible from the console. The wind system has a lively but controlled responsiveness, which is optimized in conjunction with the tremulant. The radius work of the case was made by steam-bending solid pieces of the French walnut. Elements of the keydesk are of Mexican rosewood (bocote) and Swiss pear, with rails of cherry. The bodies of the manual keys are of yellow cedar, and the natural coverings are of Turkish boxwood and the sharps of Mozambique grenadilla. The drawstops are of grenadilla, with inlays of porcelain. The keys of the pedalboard are of French walnut, with coverings of quartered maple for the naturals and grenadilla for the sharps.